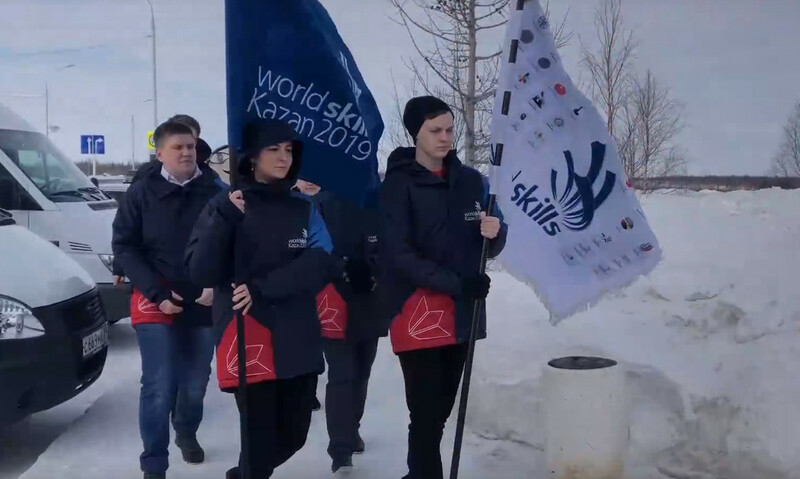 The WorldSkills flag relay was taken in the regional capital – Salekhard. On the route Yamal is the twentieth. Yesterday the symbol was in Izhevsk, and today it was welcomed at the airport of Salekhard and passed to the participants from Noyabrsk. In their turn, they will pass the flag relay to Yaroslavl Oblast. On the 18th of March the flag participated in the ceremony of crossing of the Polar Circle. Its honoring is planned for the 19th of March – the opening ceremony of the Arctic educational forum. The meeting of the representatives of the organizing committee and students of Yamal will take place on the same day. The students will go to the capital of Tatarstan in the end of August to the 45th world championship “WorldSkills”. The delegation of Yamal will include 36 schoolchildren and students of Yamal colleges and 4 pedagogues. The Russian stage of the relay is taking place within corporate and branch championships, touching upon all centers of the federal regions. Flag visits regions of industrial leaders and the largest enterprises of the Russian Federation, and then will travel around the Republic of Tatarstan. The opening ceremony of the 45th world championship in professional skills according to the WorldSkills standards in Kazan, which will be held from the 22nd to the 27th of August, will be the final point of the WorldSkills flag relay. The right to hold it was won by Russia on the 10th of August of 2015 at the General Assembly of the WorldSkills international organization in Sao Paulo (Brazil).